Few political associations have had as disastrous an outcome as the one forged between Adolf Hitler and Benito Mussolini. The Axis alliance in defeat ultimately destroyed its two founders and their regimes, as well as the lives of millions of people. A fascinating study of Ireland during WWII and their struggle to maintain neutrality. Armistice Day: The Great War, World War or War To End All Wars ends with the defeat of the Central Powers. Interestingly, Churchill, Roosevelt and Stalin all privately write this day that the war is far from finished; that this is merely a lull in the storm that is sure to erupt again. 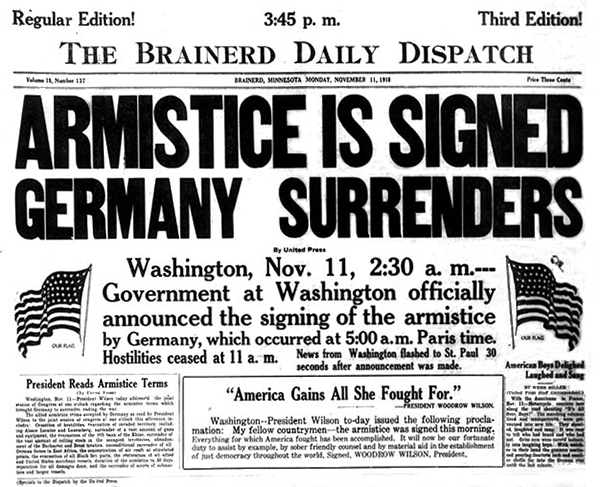 end of the "War To End All Wars"
US President Woodrow Wilson first proclaimed Armistice Day for November 11, 1919. Congress passed a concurrent resolution seven years later, requesting that President Calvin Coolidge issue another proclamation to observe November 11 with appropriate ceremonies. A Congressional Act approved in 1938 made the 11th of November in each year a legal holiday: "a day to be dedicated to the cause of world peace and to be thereafter celebrated and known as Armistice Day." In 1945, the idea began to spread to expand Armistice Day to honor all veterans, not just those who died in World War I. A bill was signed into law in 1954 making Armistice Day a national holiday. Congress then amended the act, replacing "Armistice" with "Veterans" and it has been known as Veterans Day since. CBI - China: Day 55 of 154 of the Japanese Invasion of Manchuria. Spain: Day 118 of 985 of the Spanish Civil War. CBI - China: Day 23 of 29 of the 1st Battle of Suiyuan. Spain: Day 483 of 985 of the Spanish Civil War. CBI - China: Day 128 of 2,987 of the 2nd Sino-Japanese War. Day 91 of 106 of the 2nd Battle of Shanghai. Spain: Day 848 of 985 of the Spanish Civil War. CBI - China: Day 493 of 2,987 of the 2nd Sino-Japanese War. Day 31 of 81 of Japan's Operation GUANGDONG. ETO - UK: Princess Elizabeth broadcasts a message to the women of the British Empire, calling them to join the war effort. Czechoslovakia: Czech student leader Jan Opletal, shot 28 Oct during a large demonstration in Prague against Nazi occupation, dies of his wounds; becoming an inspirational martyr in Czech history. CBI - China: Day 858 of 2,987 of the 2nd Sino-Japanese War. 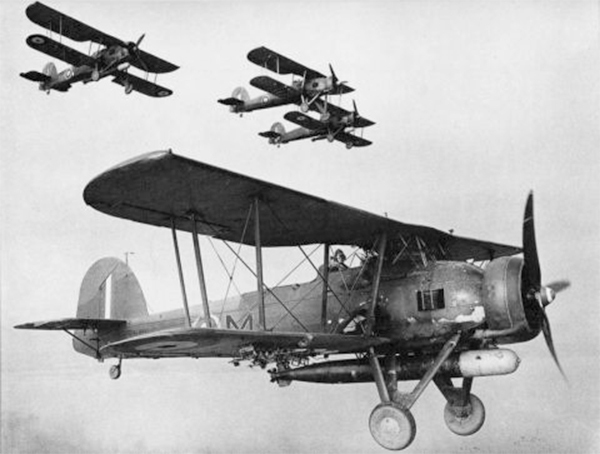 MTO - Italy: 24 British Swordfish torpedo bombers launched from the carrier HMS ILLUSTRIOUS cripple the Italian fleet at Taranto, losing only 2 planes to anti-aircraft fire. The Battle of Taranto was the first all-aircraft ship-to-ship naval attack in history. The Royal Navy sent twenty-four obsolescent biplane torpedo bombers from an aircraft carrier in the Mediterranean Sea and struck the battle fleet of the Regia Marina at anchor in the harbor of Taranto utilizing aerial torpedoes despite the shallow depth of the harbor. The devastation wrought by the British carrier-launched aircraft on the large Italian warships was the beginning of the rise of the power of naval aviation over the big guns of battleships. The Italian fleet lost half of its capital ships in one night, and the next day the Regia Marina transferred its undamaged ships from Taranto to Naples to protect them from similar attacks. The Royal Navy had developed a rather ingenious method of preventing torpedoes from diving too deep. A drum was attached beneath the nose of the aircraft, from which a roll of wire led to the nose of the torpedo. As the torpedo dropped, the tension from the wire pulled up the nose of the torpedo, producing a belly-flop rather than a nose dive. The Imperial Japanese Navy's planning staff carefully studied the attack on Taranto during planning for the attack on Pearl Harbor, though they did not borrow the British method of keeping the torpedo noses up. They had already been using a breakaway wooden nose to soften the torpedo's impact with the water and were perfecting breakaway wooden fins for added aerial stability which would be employed at Pearl Harbor. ETO - UK: Day 67 of 258 of the Blitz. East Africa: Day 155 of 537 of Italy's East African campaign in the lands south of Egypt. CBI - China: Day 1,224 of 2,987 of the 2nd Sino-Japanese War. Day 363 of 381 of the Battle of South Guangxi. CBI - Thailand: Day 42 of 221 of the Franco-Thai War (Vichy France vs Thailand). Russian Front - Finland: Day 136 of 142 of Operation SILVER FOX, a joint German-Finnish campaign to capture the Russian port of Murmansk in the Arctic. Russian Front - Finland: Day 134 of 140 of Operation ARCTIC FOX, a joint German-Finnish campaign against Soviet Northern Front defenses at Salla, Finland. Russian Front - Finland: Day 143 of 164 of the Battle of Hanko. The Soviets will be forced off their leased naval base. Russian Front: Day 143 of 167 of Germany's Operation BARBAROSSA. Russian Front - North: Day 65 of 872 of the Siege of Leningrad. Russian Front - Center: Day 41 of 98 of the Battle of Moscow. Russian Front - South: Day 13 of 248 of the Siege of Sevastopol, Crimean Peninsula. MTO - Libya: Day 216 of 256 of the Siege of Tobruk. East Africa: Day 520 of 537 of Italy's East African campaign in the lands south of Egypt. CBI - China: Day 1,589 of 2,987 of the 2nd Sino-Japanese War. 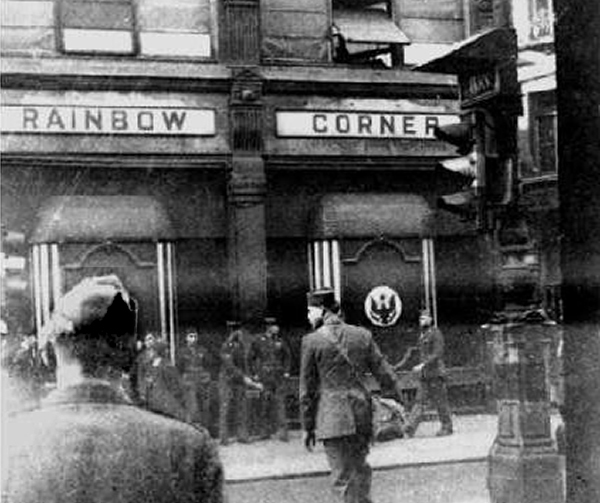 UK: The American Red Cross opens the famous Rainbow Corner Club near Piccadilly Circus in London. It will provide free 24-hour services of food, snacks, music, dancing, arcade games, and even a barbershop and hot showers to US servicemen until 09 Jan 46. The Rainbow Corner Club was an attempt to bring a touch of the United States to the troops stationed thousands of miles from home. The club's doors never shut and up to 60,000 meals were routinely served in a single 24-hour period. The American Red Cross, at the request of the Army and Navy, provided recreation and welfare facilities for US armed forces in foreign countries and islands. They employed 5,000 paid workers during WWII and built up a massive force of some 140,000 volunteers. They operated large service clubs, such as the Rainbow Corner Club in London, and small service clubs, such as Doughnut Dugouts for troops, Fleet Clubs for sailors and Aeroclubs for airmen. They operated clubmobiles and cinemobiles in forward or isolated combat areas, staffed and supplied 2,000 recreational facilities overseas and maintained presence in staff homes and stateside hospitals. The American Red Cross provided hospital, nursing and emergency services, supplemental services (such as art exhibits and hospital parties), relief to Prisoners of War, civilian relief, and delivered extra supplies ranging from books to musical instruments, to 4,096 military stations and hospitals within the United States. USA: Lend-Lease aid is extended to the Free French Forces under General de Gaulle. ETO - France: German and Italian troops invade unoccupied Vichy France. Russian Front - North: Day 430 of 872 of the Siege of Leningrad. Russian Front - North: Day 191 of 658 of the Siege of the Kholm Pocket, USSR lays siege to the Kholm Pocket but the Germans hold out for a about a year and a half. Russian Front - South: Day 137 of 150 of Germany's CASE BLUE, the failed offensive to take the Caucasus oil fields. Russian Front - South: Day 81 of 165 of the Battle of Stalingrad, bloodiest battle in human history. MTO - Egypt: Day 20 of 20 of the 2nd Battle of El Alamein. The British 8th Army drives the last of the Axis forces from Egypt. MTO - North Africa: Day 4 of 9 of Operation TORCH, the invasion of Morocco and Algeria. MTO - Libya: US B-24s hit shipping north of Bengasi. CBI - China: Day 1,954 of 2,987 of the 2nd Sino-Japanese War. PTO - Alaska: Day 158 of 435 of the Battle of Kiska, Aleutian Islands. The US and Canada will defeat the Japanese invaders. PTO - Malaya: Day 266 of 357 of the Battle of Timor Island, a long guerrilla war ending in Japanese victory. PTO - New Guinea: Day 114 of 119 of the Battle of the Kokoda Track. The Australians continue pushing back the Japanese troops. PTO - Solomon Islands: Day 97 of 187 of the Battle of Guadalcanal. ETO - Germany: US 8th Air Force B-17s hit two target areas inside Germany. Russian Front - North: Day 795 of 872 of the Siege of Leningrad. Russian Front - North: Day 556 of 658 of the Siege of the Kholm Pocket. USSR lays siege to the Kholm Pocket but the Germans hold out for a about a year and a half. Russian Front - South: Day 80 of 122 of the Battle of the Lower Dnieper River, USSR. Russian Front - South: Day 9 of 10 of the 2nd Battle of Kiev, Ukraine. MTO - France: US 15th Air Force B-24s attack targets at Antheor. MTO - Italy: US 12th and Royal Air Forces provide air support for the Allied ground troops. CBI - China: Day 2,319 of 2,987 of the 2nd Sino-Japanese War. Day 10 of 49 of the Battle of West Changde. PTO - New Guinea: Day 10 of 10 of the Bombing of Rabaul, a joint US, Australian and New Zealand carrier and land-based attack on the Japanese cruiser force at the naval base at New Britain. The Curtiss SB2C Helldiver carrier-based dive-bomber makes its combat debut from the USS BUNKER HILL. PTO - New Guinea: Day 54 of 219 of the Battle of Shaggy Ridge. PTO - New Guinea: Day 51 of 162 of the Battle of the Huon Peninsula. PTO - Solomon Islands: Day 11 of 295 of the Battle of the Bougainville Islands. ETO - France: Day 103 of 284 of the Battle of Brittany. ETO - France: Day 58 of 236 of the Siege of Dunkirk. ETO - France: The German 1st Army HQ leaves Metz as the US 3rd Army gains three bridgeheads over the Moselle (river). ETO - Germany: Day 54 of 145 of the Battle of Hürtgen Forest. ETO - Germany: US 8th Air Force sends 482 heavy bombers and 367 fighters attack oil refineries and marshalling yards in western Germany. Russian Front - Finland: Day 58 of 223 of the Lapland War. Finland and Russia have joined forces to kick the Germans out of Finland's most northern province. Russian Front - Center: Day 28 of 206 of the Battle of the Courland Pocket in Latvia. Russian Front - Center: Day 21 of 99 of the Siege of Memel, a border town of Lithuania and East Prussia. Russian Front - Center: Day 59 of 72 of the Battle into East Prussia and northern Poland. Russian Front - South: Day 14 of 108 of the Battle of Budapest, Hungary. Russian Front - South: Day 59 of 72 of the Battle of Belgrade, Yugoslavia. MTO: US 15th Air Force heavy bombers attack targets in Germany, Austria and Italy. MTO - Italy: US 12th Air Force and RAF provides air support for the Allied ground units. CBI - Burma: Day 225 of 302 of the Chinese Salween Offensive in Burma. CBI - China: Day 2,685 of 2,987 of the 2nd Sino-Japanese War. Day 209 of 259 of Japan's Operation ICHI-GO. PTO - Japan: Iwo Jima is bombarded by the US Navy. PTO - New Guinea: Day 320 of 597 of the Battle of New Britain. PTO - New Guinea: Day 204 of 481 of the Battle of Western New Guinea. PTO - Palau Islands: Day 58 of 74 of the Battle of Peleliu (Operation STALEMATE II). PTO - Philippines: Day 23 of 299 of the 2nd Battle of the Philippines, aka the Liberation of the Philippines or the Philippines Campaign. PTO - Philippines: Day 23 of 73 of the Battle of Leyte. PTO - Philippines: Day 1 of 41 of the Naval Battle of Ormoc Bay. The retreat of the US from global geopolitics, the weakening of the UK and France, Russian isolation following the 1917 revolution, the resurgence of German power in Europe and the rise of Japan in East Asia. Low-level strikes against enemy shipping by torpedo-carrying aircraft were perhaps the most dangerous forms of air attack developed during WWII, and few isolated actions had such a direct impact on naval and military actions. One of the bloodiest Allied struggles against the Axis, the horrific conflict saw over 350,000 casualties, while the worst winter in Italian memory and official incompetence and backbiting only worsened the carnage and turmoil.